Astronomers used a cutting-edge camera mounted on one of the world’s largest telescopes to discover 83 new quasars – powered by central, supermassive black holes – in the very early universe. … increases the number of black holes known at that epoch considerably, and reveals, for the first time, how common supermassive black holes are early in the universe’s history. In addition, [the discovery] provides new insight into the effect of black holes on the physical state of gas in the early universe in its first billion years. Want to see one of the new quasars up close? You can’t. They are simply too far away. The image below shows one of the newly discovered quasars. It’s impressive, when you remember its light came to us from more than 13 billion years ago. 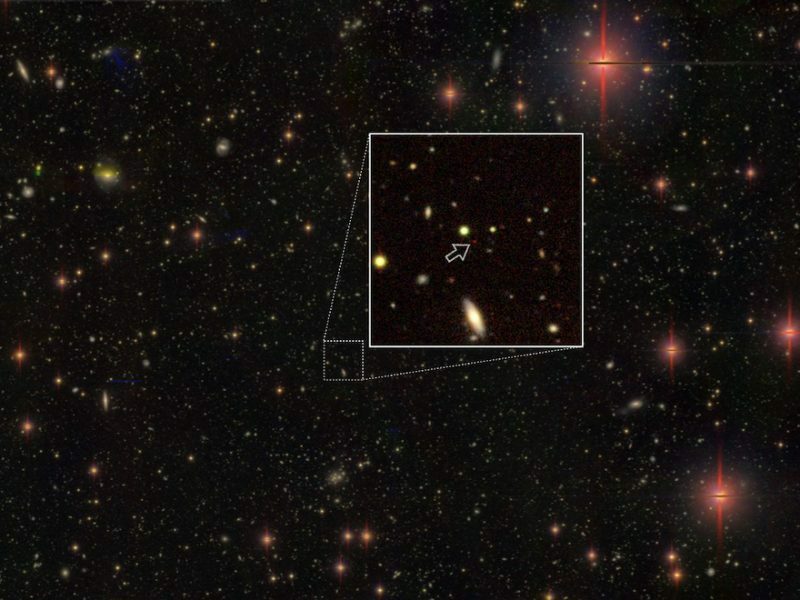 Light from one of the most distant quasars known, powered by a supermassive black hole at its core, some 13.05 billion light-years away from Earth. The other objects in the field are mostly stars in our Milky Way, and galaxies seen along the line of sight. Image via Hyper Suprime-Cam/Subaru Telescope/NAOJ. Let’s talk for a minute about how astronomers discovered all these new black-hole-powered quasars. The research team led by Yoshiki Matsuoka of Ehime University in Japan used data taken with an instrument called the Hyper Suprime-Cam, mounted on one of the largest telescopes in the world, the Subaru Telescope of the National Astronomical Observatory of Japan, located on the summit of Mauna Kea in Hawaii. 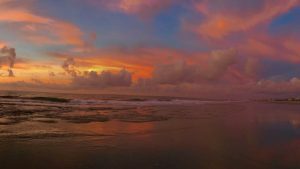 The Hyper Suprime-Cam, these astronomers said, is particularly powerful in that it has an exceptionally large field-of-view, seven times the area of a full moon. 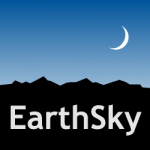 The Hyper Suprime-Cam team is currently engaged in carrying out a survey of the sky using 300 nights of telescope time, spread over five years. The survey revealed the 83 previously unknown very distant quasars, presumably with supermassive black holes at their cores. The discovered quasars are about 13 billion light-years away from the Earth; in other words, we are seeing them as they existed 13 billion years ago. The time elapsed since the Big Bang to that cosmic epoch is only 5 per cent of the present cosmic age (13.8 billion years), and it is remarkable that such massive dense objects were able to form so soon after the Big Bang. The most distant quasar discovered by the team is 13.05 billion light-years away, which is tied for the second-most-distant supermassive black hole ever discovered. 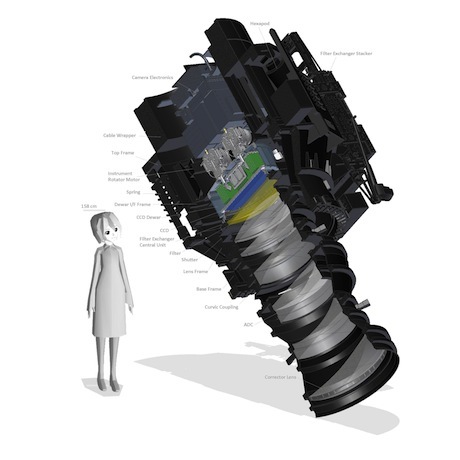 Artist’s concept of the Hyper Suprime-Cam instrument on the Suburu Telescope. It is a gigantic digital still camera; its height is taller than a human being and its weights about three tons. The camera has an exceptionally wide field of view. Image via NAOJ. Supermassive black holes are found at the centers of galaxies, and have masses millions or even billions of times that of the sun. While they are prevalent in the present-day universe, it is unclear when they first formed, and how many of them exist in the distant early universe. 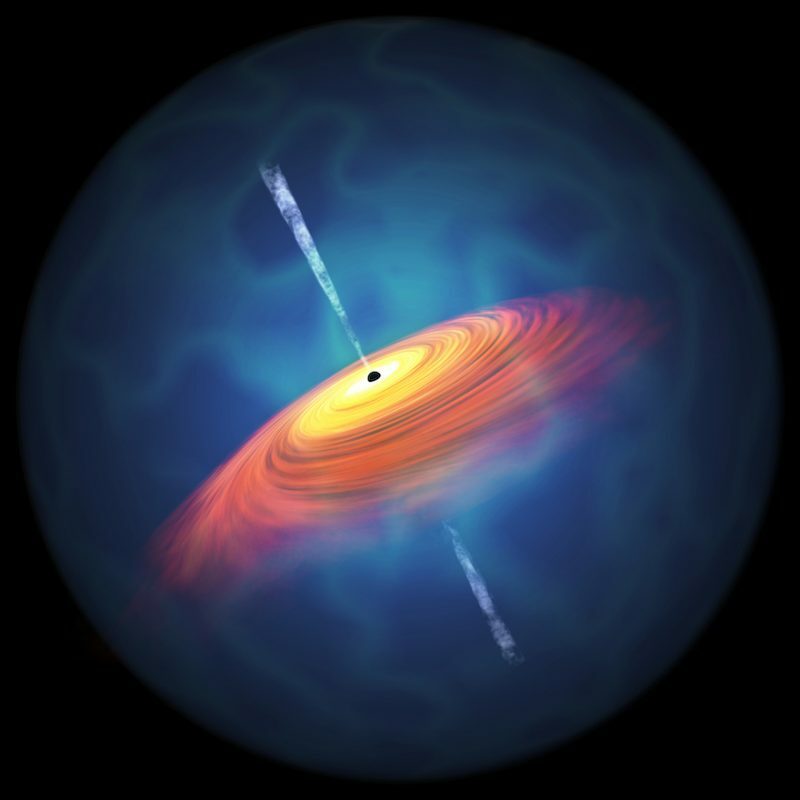 While distant supermassive black holes are identified as quasars, which shine as gas accretes onto them (see the artist’s concept below), previous studies have been sensitive only to the very rare most luminous quasars, and thus the most massive black holes. The new discoveries probe the population of supermassive black holes with masses characteristic of the most common black holes seen in the present-day universe, and thus shed light on their origin. The quasars we discovered will be an interesting subject for further follow-up observations with current and future facilities. We will also learn about the formation and early evolution of supermassive black holes, by comparing the measured number density and luminosity distribution with predictions from theoretical models. Based on the results achieved so far, the team said it is looking ahead to search for yet more distant supermassive black holes, and to reveal the epoch when the first supermassive black hole appeared in the universe. Artist’s concept of a quasar. A supermassive black hole sits at its center. The gravitational energy of material accreting onto the supermassive black hole is released as light, and thus quasars are extremely luminous and can be seen across billions of light-years of space. Image via Yoshiki Matsuoka. 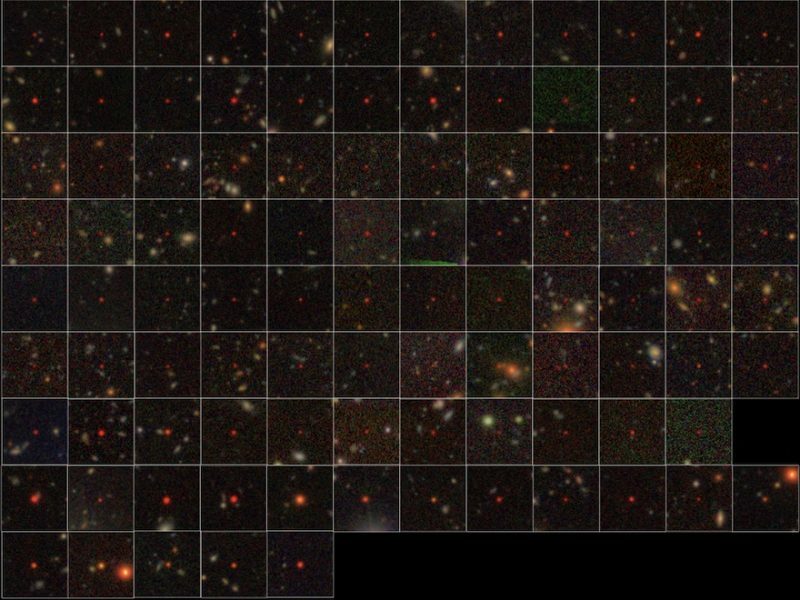 Bottom line: Astronomers used a cutting-edge wide-field camera, the Hyper Suprime-Cam – mounted on one of the world’s largest telescopes, the Subaru Telescope in Hawaii – to discover 83 new quasars. The quasars are thought to be powered by central, supermassive black holes. We’re seeing them at a time when the universe was less than 10 percent of its present age.